"Here it is. Capricorn. Eats houses and leaves." May brought the sun. Burning sun. Taking breakfast outside, we felt it tickling the skin. Factor 12 was required, especially on Perry's thinning crown! This month also brought a welcome addition to the team. Caroline's parents, Marianne and Peter, drove down for two and a half weeks of sun, salads and sawing. They came well prepared. Their car was full to the gunnels with the last of our belongings we had left behind, as well as tools, lamps, chairs, plants, bags of japanese and chinese food ingredients and birthday presents. This time it was no surprise. 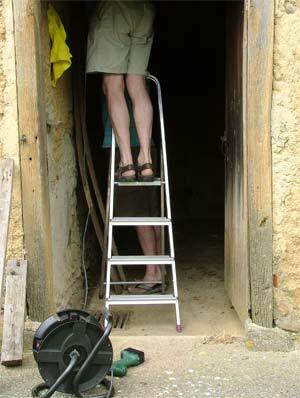 Caroline had been busy adding the finishing touches to their makeshift bedroom all week. In that same week, we had heard some unusual sounds in the timbers of the chai (the wine cellar at the back of the house). Calling in 'Allo Diagnostic', the agent brought a screwdriver and wrenched a few chunks out of the well-chewed wood and confirmed our suspicions. We have capricorn (long-horn beetle/boktor) in some of our beams. They lay eggs in a small gap in the wood and that grows into a lava about 1cm broad and 6cms long with sharp teeth. They only eat the softer part of the oak and exit after up to four years as a full grown beetle. The visit cost us € 200 for a ten minute diagnosis. Now to tackle the problem, which will cost us a lot more. We bought litres of Xylophène to treat the timbers, but in the country and with such a large amount of wood in the house, we will probably never win. Not to worry. Oak is too hard for them to chew. 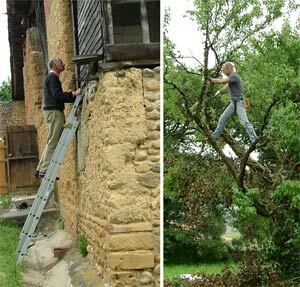 And then one of the many fruit trees let loose. 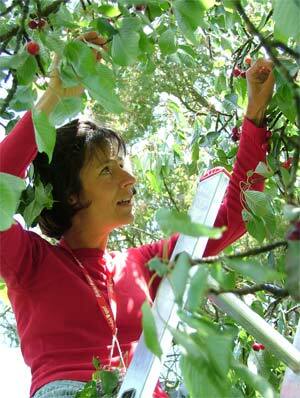 We had already noticed the large amount of cherries that were starting to ripen. Suspecting the imminent downpoor of succulent May Duke cherries, Caroline had asked her parents to bring lots of jam jars as well as a cherry stoner. We all did overtime, risking our lives on ladders, picking in total more than 40 kilos, cleaning, stoning and then making jams and eau de vie. There were also nightly competitions to see who could spit their cherry stone in a glass, as we consumed at least a kilo per day, fresh from the tree. Peter and Marianne saw to it that a whole list of odd jobs was ticked off during their stay. It is amazing how much time goes into what seems a simple job and what a joy to have help from such a special handy man and his wife! The arrival of Jeroen, Caroline's brother, a great DIY-er (Doe het zelf), put muscle in the team for the final dash. Clearing trees of ivy and cementing the cross (which we found in the attic) in the pillar at the beginning of the drive. It was great to have our own family as guests and it became extremely normal to have them around the house. In the meantime, Perry was being inundated by commissions ranging from website designs to illustrations and the writing of several press releases. It is a challenge to see how we cope, allocating time for work around the house, time for guests, and work in the office. We sometimes have to remind ourselves that we moved here to get away from the stress. Mind you, any income is welcome if we are to achieve our dream. Perry will update his Baguette Magique site with new work, once he gets a break in his tight schedule! In our endeavour not to remain complete strangers in this tiny village, we started to introduce ourselves to our immediate neighbours. The visit of an older neighbour is worth mentioning since it told us a lot of what is happening in the village. We are au courant now when it comes to village gossip, gossip and gossip. Of course we promised we wouldn't tell anyone a thing, (but...did you hear about...). We also got to know more about the former inhabitants of our house and how people lived here only 50 years ago. Not a very easy life and sometime harsh, especially for women. Just before the departure of Caroline's family, we had a brief visit from her uncle and aunt, Paul and Melita who stopped by on their way back to their home in Portugal. We had a nice last evening before they all left. With tears in our eyes, we waved until the hills took the car out of our view. The house seemed empty for days and we were a little homesick for their company. June brought a heatwave. Temperatures of 35c and little wind. Until that fateful night, that is. 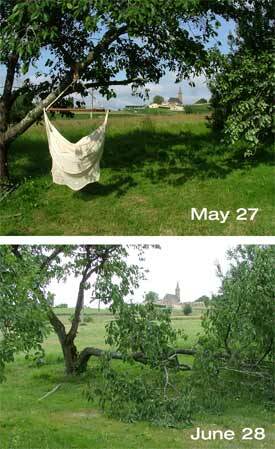 The weather forecast was right; storms and high winds. At midnight they really picked up. We were in our bed listening to the awesome power of nature. Looking outside into the black night we saw the trees taking their deepest bows to thrashing gusts, putting great strain on the electricity and telephone cables, which hang between the highest branches. It was scary, because we don’t know the house that well yet. Perry went out with a torch and found one of the shutters was blown open. Thankfully no roof tiles were removed, but Perry’s favourite office space is no more. It's not all moos and baahs that you hear in the country. One evening we went to a house concert, held by two classical pianists from Paris. They have a tumbledown farmhouse about 15kms away. We joined our friends and neighbours Peter and Janneke and chatted with a few known faces from Castelnau Magnoac and Trie. The concert was great, if a little long and the simple dinner afterwards, didn't start until 11pm. The outside of our house is overrun by lizards, very tame characters that scatter before your feet and loiter under our table outside, pouncing on any wayward crumbs. There is also a snake in the porcherie, where Caroline keeps her gardening tools. It is a couleuvre, a sort of python. Not venomous, but at more than a metre and a half long, is still a little scary. It skids away at any noise, so we stamp about before going in. We also have a family of bats in the grange and two barn owls that sweep in and around the house late each evening. Our resident partridge hasn't been around for a week, so we hope he hasn't ended up in a pot. At the end of June, we had a visit from Caroline's niece Jacqueline and her husband Marc. 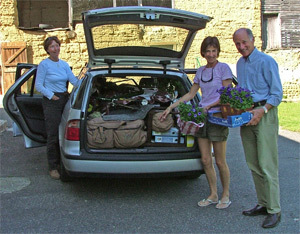 They drove from Venlo and were on their way, albeit via a large diversion, to the Charente, just north of Bordeaux. 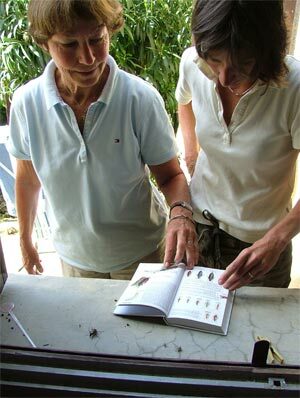 The wine cave in Trie saw their profit go up over the next few days and the wildlife jumped out of its skin on several occasions as the laughter burst out during our al fresco dinners. © 2005 Perry Taylor and La Baguette Magique, France.